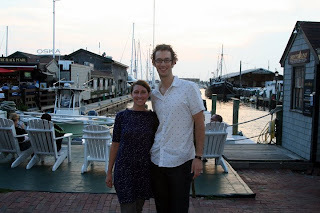 My wife is an amazing travel planner, so when her birthday rolled around and I promised to plan a surprise excursion, I knew the pressure was on! We had just moved to NYC a few months before and were craving a respite from the intensity of the city. We no longer own a car, and we were spending a good deal of our income setting up our new apartment, so the trip had to be cost effective. This proved to be quite a challenge considering the prices of lodging in Newport, but fortunately my folks were able to provide some Marriott points which gave us two free nights at the Marriott! The next challenge was a car rental, I took a chance and booked with Jolly Wheels, a rental agency with used cars, but one that will deliver the car anywhere in the 5 boroughs. The day we left, I got off work and packed up the car which was waiting for me. We got lucky and the car was in good shape (not our experience with subsequent rentals) and even had a sun roof. I surprised Ashley by picker her up at work (up to this point she was in the dark about where we were going, or how we would get there). I hate to admit it, but it felt good to be back in a car where we could control our climate and sounds, and could be one step removed from the action of the city. It was a beautiful drive out of the city, heading along the eastern edge of the island. In preparation for the long drive, I had done some research on good places to eat along the way on a site called “Roadfood.” It seemed like all of a sudden we were far from the Manhattan, and the cities where I had found places to eat began to pass us by. We frantically began to call ahead trying to figure out just where these places were and how late they were open. We knew we were out of the city when some of the places stopped dinner service at 9pm. Ashley loves lobster, or maybe she loves the accompanying butter, but in any case, when she read about Flanders Fish Market and their excellent lobster rolls we knew we had found our dinner. The restaurant was indeed charming, though almost deserted at the late hour of 8:30. The quality of the food did not disappoint and I was introduced to the lobster roll for the first time in our lives. It was an instant favorite with lumps of succulent lobster (hot—as they like it in Connecticut) and melted butter on a toasted roll. After dinner we pressed on to Newport. We arrived late in the evening where we were met with the usual efficiency and courtesy we’ve come to expect from the Marriott. In the morning, we enjoyed their complementary breakfast while looking over the port. It was lovely indeed, and was a great way to start our trip. I had read about the Cliff Walk and the many cottages one could see and was eager to begin exploring. The cottages are more aptly called mansions; they were the retreats of the richest Americans, such as the Astors and Rockerfellers, and were built in the late 1800s before the 16th amendment allowed property tax. Consequently, to say they are big is a gross understatement. We started at the far end of the path and began the walk. Being so close to the water was lovely; we decided to forgo all but one of the mansions. The Breakers was designed and built by Richard Hunt for the Vanderbilts, who also worked on the Louvre, designed the pedestal for the Statue of Liberty, and the 5th Avenuefacade of the Metropolitan Museum of Art. Of all the mansions, this one sounded the most intriguing. The approach to the house… er… cottage… um, castle… was impressive; a few people we picnicking on the lawn and were enjoying the same view its owners would have had years ago. When we made inquiries as to the tour inside, we found it was $20 per person and an hour wait. Ashley and I were hot to walk and didn’t want to wait that long, especially at those prices, so we enjoyed the gardens and facades and journeyed on. As the path wound through, we were presented with breathtaking views of the coast and of the other cottages lining the coast. The cliff walk, which started as a paved path, degraded into something more consistent with its namesake, and at some points we just skipped across the tops of rock cliffs. Nothing challenging or technical, but I was glad I had good walking shoes. The end of the walk is somewhat anticlimactic, and we turned back onto the road for the long walk though the island to where our car was parked. We had worked up an appetite and were ready to find somewhere to eat. Cross referencing our Frommer’s guide with Roadfood.com, we decided to try Flo’s Clam Shack. A short jog from the beach, this shanty had an attractive, relaxed feel and an excellent selection of straight shooting seafood. Ashley opted for another lobster roll while I tried the fried clams and a crab roll. the merits of various restaurants in the area. Black Pearl was mentioned many times by visitors on Chowhound, but something about it didn’t seem quite right—a little too much tavern and not enough restaurant. Tucker’s Bistro was on the short list, but we wanted something that featured fresh seafood more than the garnishes and sauces. In the end we settled on Scales and Shells, which seemed to have the right focus on fresh seafood and excellent preparation. Ashley opted for… the lobster, while I had a whole fish. Both were good, and though we had an excellent evening, the food was not all that it could have been. After a stroll down Thames St. (prounced with an American “TH” to differentiate themselves from the Brits) we arrived back at our hotel for the last night. In the morning I had reservations for brunch, possibly our favorite meal, at Castle Hill Inn. We drove 20 minutes outside the city to the tip of the island and settled in for a lovely meal. The cocktails were superb and the food delicious. Best of all, though, was the building itself and the view. The Inn or at least a building where the inn now stood was garrisoned during the Revolution and the War of 1812 and then became a summer house for a scientist who would provide rooms for students. Eventually, it was converted to an Inn. Now the inn offers its guests, and those who dine there, Adirondack chairs from which there are stunning view of the bay. After finishing our meal, we carried our Dark and Stormies out to the chairs to take in the view. Reluctantly, we left Newport and headed back to the city. Wishing to take full advantage of the car and explore Connecticut, we detoured off the main road and headed into Mystic. Though we were too late to see the historic seaport, it seemed that if you had a day or half a day, there was much to explore there. We headed instead to the main street of Mystic. A market was just wrapping up, so we got out and strolled through the street and over the drawbridge. We were tempted by Mystic Pizza, but we had our sights set on somewhere else for dinner. own drinks so, in accompaniment to our dinner, we shared a mini bottle of white wine. Our dinner arrived just as the sun slipped into the ocean. Ashley finished off the trip with the last, and one of the most delicious, lobster rolls, while I opted for a crab roll and Stuffies (a regional specialty of quahog clam, breadcrumbs, and veggies cooked together in the shell). Everything we ate was wonderful, enhanced I am sure, by the sauce of the fresh air, a beautiful view, and excellent company. At the end of the day Ashley and I had a very affordable, enjoyable trip and returned to the city refreshed!